The corner lot at Highway 33 and Wilson Lane (Main Street) including the high school parking lot was the hot topic at the February 7th School Board Workshop. Marty Gibbs, 1st District Board Member, thanked Keep Union County Beautiful for picking up litter and trash on the high school property. Mr. Gibbs also commented that he had received several texts and phone calls from citizens and even students regarding the appearance and messages received by visitors especially during high school games. Mr. Gibbs also expressed that going forward he hoped that the system could keep our school grounds clean within the system and not rely on the county personnel or KUCB. Maynardville Mayor Marty Smith and City Councilman Ty Blakely addressed not only litter concerns, but also sign clutter at the same corner. They offered to seek a grant to establish and maintain a small city park if the Board would give them the corner property. This “solution” triggered a stream of questions that covered state easements, safety barriers, sign ordinances, grant amounts, long term lease, landscaping, and park use and users. Representatives of Maynardville City will return with some more specific information and “walk the area “ with board members prior to the next school board meeting on March 14. 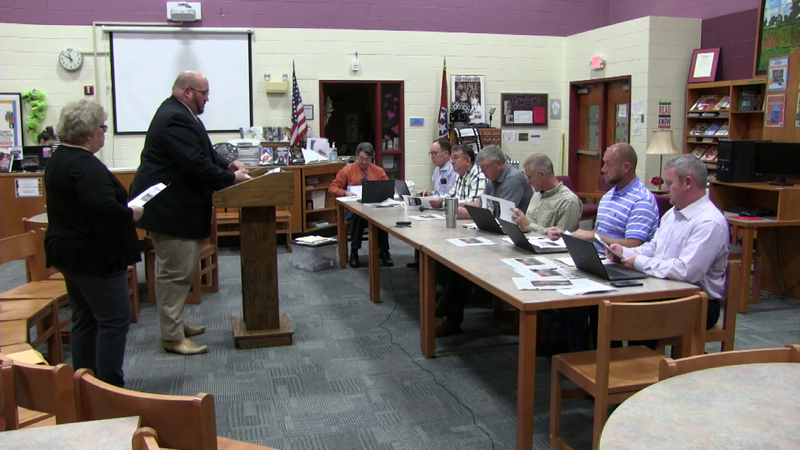 During the meeting, the Board approved a trip by the MES Beta Club to Pigeon Forge, the budget amendments and transfers, and TSBA recommended board policy changes. In addition, board members voted to satisfy their required annual training by holding a joint planning workshop in Knoxville in June. Dr. Jimmy Carter, Director of Schools, will be evaluated by the board in March. Dr. Ronnie Mincey explained the activities and purpose of the Student Support and Academic Enrichment Grant to promote mental health for students. The board accepted the grant's $30,000 which will provide programs in all county schools. The next meeting will be at 6:00 pm on March 14, at UCHS. Gerald Smith from 7th District and Brad Griffey from the 2nd District did not attend the meeting. Maynardville Mayor Marty Smith and City Councilman Ty Blakely discuses establishing a small city park at the corner property of UCHS.